We are very proud of the diverse wildlife to be seen here on Treasure Island. Our conservation program aims to have minimal impact upon the native animal species and habitats found on and around the island. We have native Fijian species which have been introduced to the island in an effort to help protect them and give them a safe haven. These species are in decline across the country due to multiple threats from farming, habitat loss and introduced predators. For example the Buff-Banded Rails and Fijian Red Shining Parrot, now endangered species, have been thriving on Treasure since they were introduced 15 years ago, illustrating the success of our long term conservation efforts. The Fijian Crested Iguana is native to Fiji and closely related to the more widespread Banded Iguana. Sadly they are now becoming very rare in the wild, with some islands having already reached extinction status. It is thought there may now be more held in captivity than are left in the wild. Crested Iguana numbers are rapidly declining across Fiji due to predation from natural and invasive species, habitat destruction, and illegal trade. 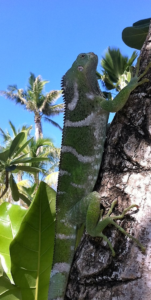 Treasure has a wild breeding population of the Critically Endangered Fijian Crested Iguana. We ensure suitable native habitat and a predator free environment. As part of the conservation program we have a photo database to try to identify individuals by their stripes and markings to better understand the population dynamics and circumvent potential genetic bottlenecks. Island refuges such as Treasure now offer one of the few safe environments for this rare species to live and breed in safety. We started with just one pair of iguanas and now have an unknown number living on the island, including at least one breeding pair! We aim to take this project from strength to strength and with a goal of helping to reintroduce them into the wild. If you are lucky enough to encounter one of our wild ones, we appreciate any photographs; however please don’t harass them as they are wild creatures! Every afternoon you can get up close and personal with our friendly resident iguanas, helping to feed them their favourite hibiscus flowers and papaya! The Fijian people remain reliant on traditional natural medicine approaches and medicinal plants are always a first choice for treatment before turning to modern medicine. Fiji abounds with reports of the incredible successes of traditional medicinal approaches, and the conservation of traditional ways of life is a critical part of Fijian culture. One story sent the international popularity of traditional Fijian medicine soaring! In 2015 Waisake Naholo, a Fijian playing for New Zealand, suffered a broken leg during a match against Argentina, ruling him out of the squad for the upcoming World Cup. Naholo refused to give in and travelled to Fiji to visit his uncle from Nadroumai for traditional treatment. Following treatment which involved kawakawarau leaves being applied to the injured leg for a number of days, Naholo was able to return to the game fit and healthy. He credits the special healing talents of his family and the leaves from this village with his ability to play in the World Cup. On Treasure we grow various medicinal plants and herbs, many of which are utilised by our staff! We also hold regular Herbal Medicine Talks to share this traditional knowledge with visitors to our island. This is one of many ancient practices passed down through generations that contribute to the rich cultural heritage of Fiji. Treasure is a sand cay with no naturally occurring fresh water. Whilst this is a blessing in that we rarely get mosquitoes, it makes life for our vegetation very challenging indeed! Our Environment and Sustainability Policy formalises our approach to planting on Treasure and we prioritise native vegetation suitable to the challenging conditions. We also strive to plant species that provide habitat and food for the wildlife that live. The conservation program aims to continuously enhance the biodiversity of our island paradise and support ever growing populations of the rare and beautiful species calling Treasure home.